Thanks Kristina for the great instructions and template for these gift card holders! 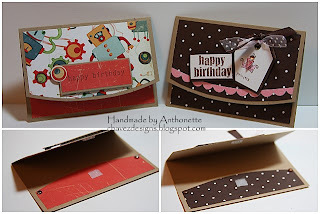 Like Kristina, I started my gift card holders with kraft paper. I love kraft paper. This project is also for the Verve "Gettin' Krafty" challenge (VVPP06). Kristina's instructions didn't call for Velcro closures, but I added them. I made these gift card holders, because we were invited to a birthday party today at my friend Rebecca's house. Her son and daughter were celebrating their 7th and 5th birthdays. My sweet hubby started getting a sore throat the other day. I started getting a sore throat last night. I didn't sleep well, either. Kalino had been looking forward to the party because it was a pirate/costume party. He had his pirate costume ready. He was an upset little "Jack Sparrow" when I told him we weren't going to the party, because we didn't want to spread our virus around. Rebecca was going to have crafts for the kids and she was serving Hawaiian food. Rebecca and her husband are like my Sweetie and I...we love Hawaii! Happy Saturday, everyone! 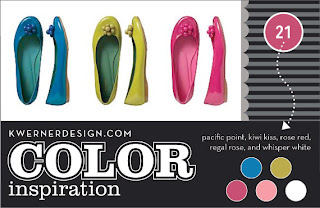 The voting is now open for week 8 of the Designer Handbag Inspiration Challenge on Theresa's blog. Today and tomorrow (until 7 PM CST on Sunday*) you can vote for my entry on her blog by adding a comment to the following blog entry. I would also like to encourage all of you to enter the competition next week. 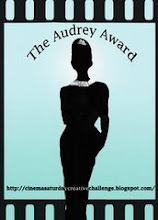 Theresa has great blog candy each week, plus there is a larger prize at the end of the 12 weeks. It's fun! * Thanks to Kristina Werner for pointing out this time conversion website. For readers outside of Theresa's timezone in the USA, select September 28, 2008 and 7:00 PM. Select USA - Minnesota - St. Paul (Theresa's timezone) for the first location. Then, put in your location/time zone and press Convert time. 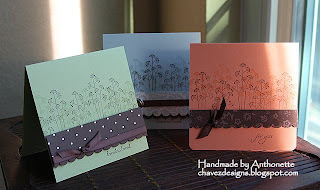 I made these cards for 3 special women: my friend Cris and her sister, Tere' and Jen Tapler's mom, Susan. All 3 women have a loved one with Alzheimer's. Cris and Tere's 72-year old mom, Natalia was diagnosed about 2 years ago. Tere' lives with her parents and is one of the primary caregivers for Natalia. Cris travels over 100 miles most weekends to help and spend time with her mother. Jen Tapler's dad is only 57 years old. Her mom Susan is his primary caregiver. They retired early in Maui. This disease is terrible. In talking with Cris and reading Jen's blog, it's easy to see the toll this disease takes on the families. I had never thought to send cards to a caregiver. This was a pleasure to do. Thank you Carolyn King for organizing this event! Her grandmother passed away from Alzheimer's. Today would've been her grandmother's birthday. She organized this event for World Alzheimer's Day which was on September 21st. She is a stamp designer for Gina K. She is donating 100% of her proceeds from this set to the Alzheimer's Association. Just when I think these challenges can't get anymore challenging....they do! Theresa must be having a blast choosing the handbags. 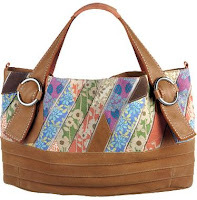 This week, the handbag is Lucky Brand Jeans Diamond Patch Tulip Satchel. 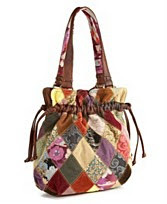 The bag is a mixture of velvet, corduroy, canvas, and floral fabrics. It was these textures that were my main inspiration for this project. A few weeks ago, Kristina gave us a curved template. I used the larger template to help me cut the sides of my card with a curve. I've had sheets of suede paper for years. This was a good opportunity to use these yummy papers. 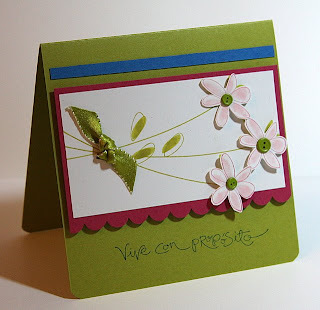 I stamped with the Priceless set on the suede paper with my Blanco Opaque White Dye Ink pad. This was also a good way to used small scraps of designer papers. My paper punch made it easy. The time-consuming part was hand-gathering the polytwill ribbon onto redline tape. You can't see in the photo, but about .5 inches from the top of the card I scored the entire length of the card to get a fold beneath the gathering. I used my Sakura Gelly Roll white pen to do some faux stitching. What a difference that makes! I threaded the polytwill ribbon through my button. I used several Zots to make sure it was secured. The sentiment is up on dimensionals. 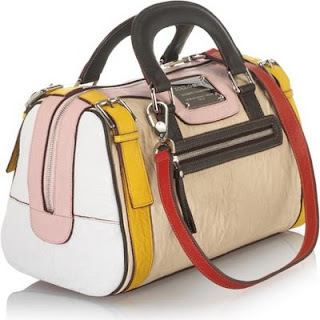 The voting is now open on week 7 of the Designer Handbag Inspiration Challenge on Theresa's blog. Today and tomorrow (until 7 PM CST on Monday) you can vote for my entry (or the competition) on her blog by adding a comment to the following blog entry. Thanks to Kristina Werner for pointing out this time conversion website. 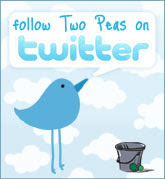 For readers outside of Theresa's timezone, select September 22, 2008 and 7:00 PM. Select USA - Minnesota - St. Paul (Theresa's timezone) for the first location. Then, put in your location/time zone and press "Convert time." I would also like to encourage all of you to enter the competition next week. It's fun! 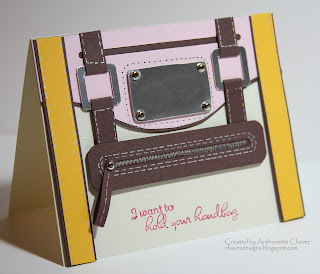 When I saw the inspiration photo for Theresa's Designer Handbag Inspiration Challenge #7, I knew I wouldn't be creating a card. 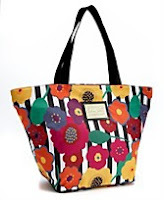 This Betsy Johnson "Flower Power" Tote is colorful and fun. In my blog surfing, I'd seen many examples of a "box in a bag". I loved the tutorial by Diana Gibbs. Her photos and instructions were great. I had never made one before, so this was a fun first attempt. I made the box base out of Basic Black cardstock. I then cut 20 1/8" strips of Basic Black cardstock and glued them on white (the black strips go all around the bag). 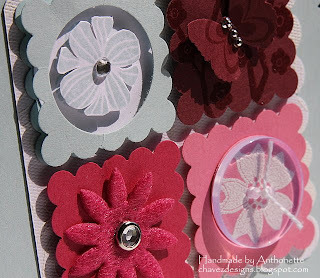 I used flowers from Die-cut Blooms as my template for cutting others flowers in Bravo Burgundy, Rose Red, and So Saffron cardstock. 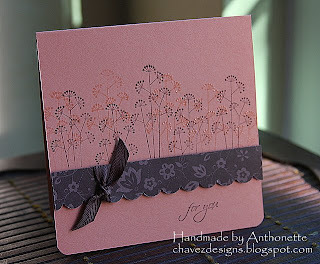 I used the dotted center from the large stamp in Eastern Blooms on the larger flowers. I covered chipboard in light copper foil paper. It was a lot of cutting, Tombo Glue, and dimensionals, but it was fun. Thanks for looking! I got this basic layout idea from the SU Spring Summer '08 catalog (p. 19). 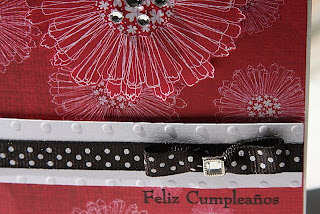 I also used the 1/4" Bravo Burgundy ribbon like cardstock too. I stitched it and gathered it. On the upper background of the circle I used one of the stamps from Pocket Silhouettes with VersaMark ink and embossed with clear embossing powder. 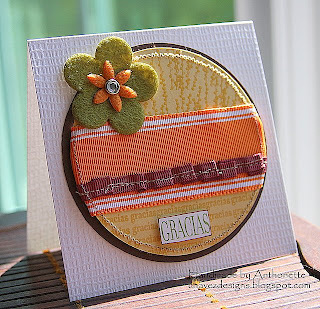 On the bottom part of the circle, I stamped the Gracias stamp from Felicidades Siempre a few times (also with VersaMark ink...and again embossed with clear embossing powder). I stitched around the circle with my sewing machine and used dimensionals to mount it on a large Chocolate Chip circle. I hope everyone had a great weekend. I love the crayon resist technique. I just had to use it for Beate's Weekend Sketch #57. 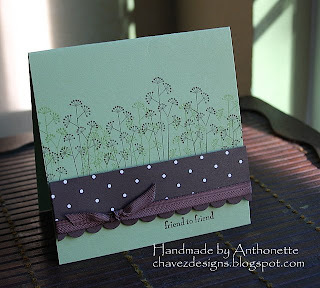 The crayon resist challenge was for the CCEE Stampers Blog. I used an old (about 10 years old!) Kaleidacolor rainbow ink pad for this card. I'm surprised it still worked. I stamped the Priceless stamps with Memories black ink on glossy paper a while back. I used a white Crayola crayon and highlighted different areas. Using a brayer, I rolled ink onto the image. I love the effect. I used the same rainbow pad to ink up Para Ti. 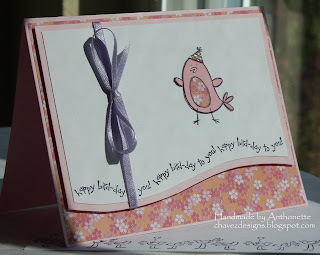 I made this card in a rush yesterday for a friend's daughter turning 2. We were invited to her party. I hate rushing. I wish I could be like Julie Ebersole, she whips out amazing 5-Minute-Quickies (5MQs as she calls them...she's so funny). Overall, I'm not happy with this card. The ribbon is too skinny. There is too much white-space...maybe I should've stamped more birds. 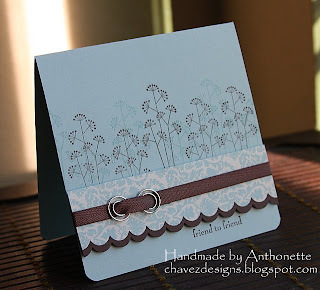 I used the nice curved template Kristina gave us on her blog. I still had origami paper on my desk from Friday's project, so that is the designer paper you see. I love the paper. I combined the bird from Pun Fun and the sentiment from all older SU set. I choose it because it's curvy. In a tribute to talented Jenn (KiyomiKrafts), I stamped the envelope too! You can see part of in at the bottom of the picture. In a lot of her YouTube videos, I'm always amazed at how much detail she puts inside the card and on the envelope. I never do that. 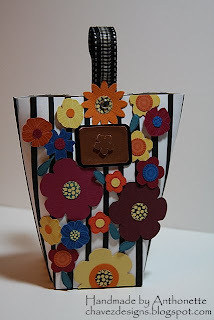 When I saw the inspiration handbag (Fossil Madeline Satchel) for Theresa's Designer Handbag Inspiration Challenge #6, I immediately thought about sewing on paper. My Mom's birthday is next week, so this was a perfect time to make a card for her. She taught me to sew when I was about 10 years old. This challenge is also a good excuse to pull out some very neglected supplies. I've had several packs of origami paper for years. I've also had this brown paper that looks like leather for a long time. I even have the matching brown envelopes. I mounted several pieces of origami and brown paper on white cardstock. The seams of the paper were right next to each other. With my exacto blade, I cut 1/2" strips of paper at an angle. I lightly mounted the 1/2" strips to cream colored cardstock. I sewed each strip of paper onto the cream cardstock. I cut 4 pieces of 1/2" thick strips of the brown cardstock. I sewed them onto the base of the card. The circle buckles were made with the 2 sizes of circle punches. I attached very thin strips of brown cardstock to the circles to make a buckle. On some of the brown cardstock I rubbed VersaMark and used clear embossing powder to give it the look of a darker leather. One of my dearest friends, Cris, has a birthday on September 11th. Her birthday dinner was abruptly cancelled 7 years ago during that terrible day in our country's history. Tomorrow, she is having a birthday dinner again. We won't be able to make it because of a previous commitment at Kalino's school. I hope she has a great party and a great day. This is one of the rare weeks that I have all the cardstock colors. I don't have all the inks though. 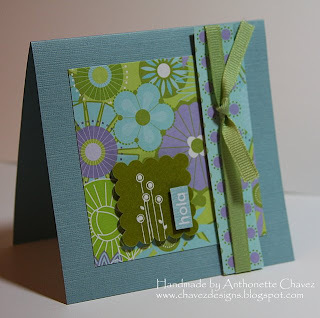 I was inspired by the collage in the Stampin' Up catalog on p. 161. Edited to Add: Forgot to list the SU scallop border punch...duh! Kalino's teacher asked all the parents to practice at home with using glues and scissors. He needs to be able to use Elmer's glue and glue sticks. He's never used liquid glue. 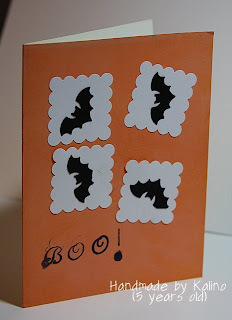 He's always loved using my paper punches, so he punched a bunch of bats and some white scalloped squares. While I was getting more supplies in my studio, he opened the Elmer's glue without me knowing. I came back to his desk to find bats drowned in glue. You could barely see any black cardstock! This is why we are practicing. He repunched more bats and more white squares. 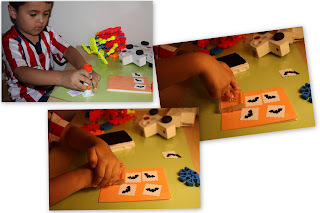 I showed him how to use Elmer's glue to glue the bats to the white squares. We let that dry and then he used a glue stick to glue the white squares to the card. He didn't want the Happy Halloween stamp. He decided he wanted a stamp that says Boo! I don't have a stamp that says that. I'm seriously lacking in Halloween stamps. I never buy any because I usually don't have time to make any cards. I have individual letters that I mounted on an acrylic block. Here's his final card. I love Beate's Weekend Sketch Challenge #56. I hadn't used my new stamp from SU. I love it in Spanish. Oops, I just realized I didn't taper off the edges of the ribbon. Oh well. Thanks for looking! Have a great week. Can you imagine the Beatles song with this title instead? 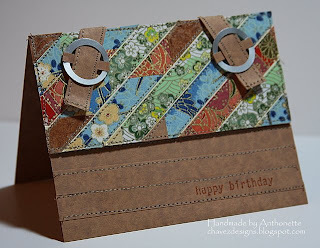 I didn't plan to make this particular card for for Theresa's Designer Handbag Inspiration Challenge #5, but since I had silver foil paper, a perfect sized piece of chipboard and some textured cream colored paper, I had to use the architecture of the Dolce & Gabbana Miss Easy Way Satchel as my inspiration for this card. Almost every Tuesday evening, I take my son to storytime at the library. I was sitting next to a woman who had a Dolce and "Cabbana" purse. Even though it was a knock-off, it had this silver riveted tag on it. I used a slit punch repeatedly to get the look of a zipper opening. I used my silver gel pen to draw in the zipper. I have a buckle punch (I've never used it) that I used on silver foil paper to get the silver brackets. I cut out the middle part of the buckle for the look I wanted. I also used the colors in the bag: Very Vanilla, Chocolate Chip, Summer Sun, Pink Pirouette, and Rose Red. I didn't use white, since I focused on the front of the handbag, and not the side. After I finished the card, I couldn't figure out what sentiment to add to it. I reached for my Verve Feeling Groovy set and the idea came to me. 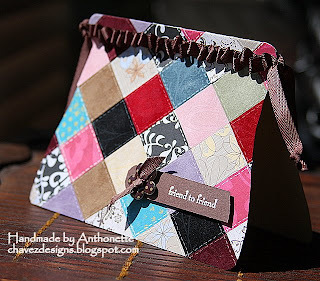 I modified a Verve stamp by adding some individually stamped letters after "hand" to create "handbag". People, I may be pulling out this trick again for future competitions. Donate to a Good Cause & You Can Win Over $200 in Brand New Stamps! Mary Jo Price-Williams is raising money for the CROP (Communities Responding to Overcome Poverty) Hunger Walk. As she says, "help others, get a tax write off and have a chance at winning over $200 in brand new stamps sets all at one time." 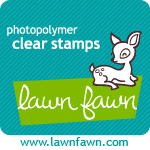 Here's a link to her site: Techno Stamper: You can win over $200 in brand new stamps! Join me in helping a great cause. Gracias! 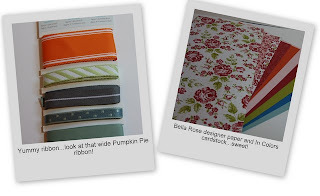 Thanks, Theresa, for the previous blog candy of yummy ribbons and the paper I received today! So great. Love it. 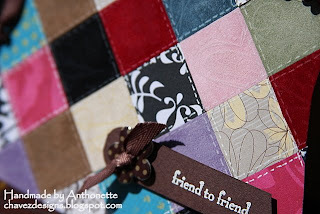 Theresa Forseth has a blog Addicted to Stamps & Scraps. She's having a 12-week Designer Handbag Inspiration Challenge. This is already week 5 of that competition. It's not too late to participate. I don't have Regal Rose, but in my excitement of new supplies, I accidentally used Pink Pirouette instead of Rose Romance. I love the new sets in Spanish! Love them!!! I wish I could have the English versions too...but, I have Anthonette money, not Oprah money! I made two birthday cards. The first card for my mother-in-law was already in the mail box when I realized I hadn't photographed it yet. I had to run outside and get it back into the house. Her birthday is at the end of the week. 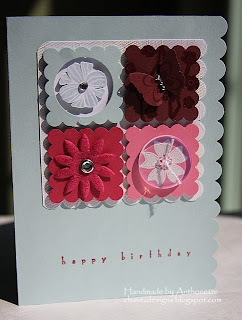 I used Provo Craft designer paper on the front of the card. I cut out four flowers from leftover paper and mounted them on dimensionals. I added Stickles to the middle of the four flowers for some bling. 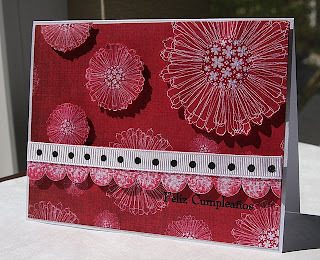 The scalloped layer is white textured paper that I brayered with Rose Red ink. I don't have my SU scallop border punch yet, so this was made using a Slot Punch by Making Memories. 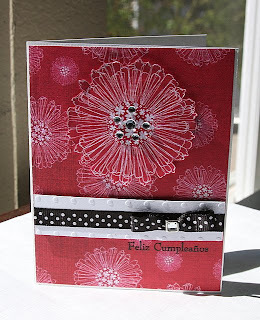 This second Feliz Cumpleanos card is for my friend, Rosa Elena. Her birthday is tomorrow. I used the same designer paper to make a slightly different card.